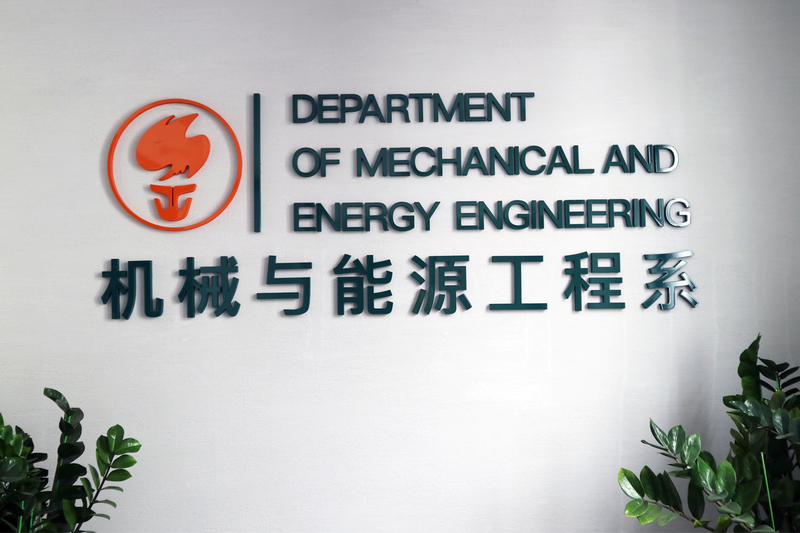 The Department of Mechanical and Energy Engineering (MEE) was born in January 2016. With distinguished faculty members, coverage of leading-edge disciplines, and advanced philosophy of education, MEE is flourishing as rapidly as time flies. Since establishment, MEE has attracted numerous high-level talents from overall the world, forming a brilliant teaching and research team. The team includes 19 tenured/tenure-tracked professors and 60 teaching professors, research professors and engineers, out of whom 1 is elected as fellow of Canadian Academy of Engineering, 6 is “SUSTech Distinguished Scholars recipients” , 1 is "Changjiang Scholar", and 1 is “SUSTech Distinguished Young Scholars recipients”. The teaching and the research scopes of MEE covers innovative design, robotics and automation, and energy engineering. Focusing on these three disciplines, five key labs are established, namely intelligent manufacturing lab, advanced forming and additive manufacturing lab, precision machining lab, robotics and automation lab, and energy engineering laboratory. MEE achieved rapid development in past years. By the end of September, MEE has been conducting more than 50 approved research programs funded by National Key Research and Development Program, National Natural Science Foundation, Guangdong Introduction Project of Scientific Innovation Team, Shenzhen Key Laboratory, Peacock Team, Peacock Technology Innovation and enterprise cooperation projects of many companies. The overall research funding within the recent two years exceeds 100 million RMB. Moreover, more than 96 research papers have been published in international top journals and conferences in the name of SUSTech; 36 invention patents and 12 practical patents have been applied. The objective of MEE is to build a world-class education and research center by integrating frontier and interdisciplinary fields and implementing a creative teaching method, which involves general education to enrich scientific knowledge of students and innovative-practical courses to train students for capability of mechanical engineer. Undergraduates of MEE, after graduation, are competent to conduct fundamental research with engineering application, develop and manufacture creative products, exploration and application of novel materials, new technologies and new processing methods, and perform engineering management. They can either continue to pursue graduate degree in MEE or related majors or engage in research and management in companies, research institutes or government-affiliated institutions. The undergraduate major of Mechanical Engineering was approved by Ministry of Education in March, 2017. The undergraduate major of Robotics Engineering is being declared and is expected to be approved in March, 2019. MEE have recruited 77 undergraduates from 2015 to 2016. MEE started the graduates program in 2016. Having recruited 2 PhDs and 9 masters in 2016, 6 PhDs from joint degree programs and 28 masters in 2017, and 19 PhDs from joint degree programs and 43 masters from SUSTech-HIT joint degree program in 2018. Beginning from 2019, SUSTech will recruit graduates independently and MEE is to recruit about 50 masters and more than 20 PhD graduates. In order to broaden students’ global field of vision, MEE makes great efforts to establish collaboration with global top universities and companies. There are plenty of opportunities for students to put knowledge into practice or do internship in research institutes or companies including exchange programs with units abroad. The current collaboration units include top universities in the US, Canada, UK, Japan, Singapore, and Hong Kong and well-known companies such as Timken, Honeywell, DJI-Innovations, and Huawei. Oriented to future development of mechanical engineering, MEE focuses on education of students with solid science foundation, interdisciplinary background as well as deep humanistic literacy. Such students could be either academic talents capable of conducting engineering and fundamental research or creative talents capable of leading an engineering project.